Torgny Näsholm is awarded the 2018 Marcus Wallenberg Prize for having documented how trees use amino acid molecules as sources of nitrogen. He has also shown how this organic nitrogen dominates the nutrition of trees in boreal forests. The findings have resulted in new types of fertilizers. For his discoveries Torgny Näsholm is awarded the 2018 Marcus Wallenberg Prize of SEK 2 million. The new insights inspired Torgny Näsholm to develop fertilizers based on amino acid and nitrogen. Field studies revealed the improvement of shoot growth when seedlings were grown on this organic nitrogen. Leaching of nitrogen was also reduced compared to conventional inorganic fertilizers. The first patent for this approach was issued in 2000 and a fertilizer called Argrow, based on the amino acid arginine, was introduced on the market. Arginine is a nitrogen rich amino acid that is easily absorbed by plants. The fertilizer is mainly used in forest nurseries in Sweden, Finland, USA, Canada, Uruguay, China, New Zealand and Australia. It is also being tested on other commercial crops and garden plants. The innovation has been further developed. Subsequent patents have highlighted improved plant growth. Seedpad is an example of another new technology for improved germination of pine and spruce seeds, that Torgny Näsholm recently developed as CEO for the startup company Arevo AB, Umeå, Sweden. More products characterized by the slow release of amino acid-based fertilizers will soon be introduced on the market. The Marcus Wallenberg Prize 2018 will be presented by HM the King of Sweden to Torgny Näsholm at a ceremony in Stockholm in September this year. 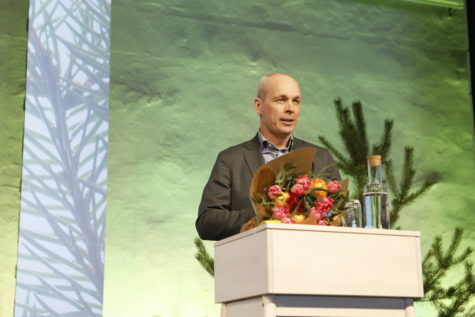 Professor Torgny Näsholm, Swedish University of Agricultural Sciences, Umeå, Sweden, is awarded the 2018 Marcus Wallenberg Prize. Photo: Johan Marklund.